The Cebu Pacific piso fare promo is back! Grab the chance to book the low fares! This is the awesome seat sale everyone is waiting for! For as low as P1 base fare, travel to your desired destination whether local Philippine places or international destinations. 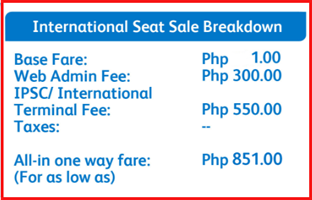 The Cebu Pacific Piso Fare seat sale is available to all destinations except Basco and Melbourne. Book the Cebu Pacific sale tickets from September 12-13, 2018 and use the Cebu Pacific promo tickets for travel from June 1 to September 30, 2018. Tickets on sale are limited and subject to seat availability. Book ASAP! Note: Search for promo tickets in different travel dates because not all flights are on promo. 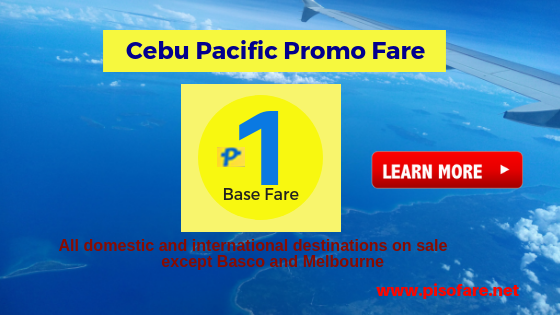 Book online at www.cebupacificair.com where you can book without a promo code. To help you in booking, read this CEBU PACIFIC ONLINE BOOKING GUIDE. 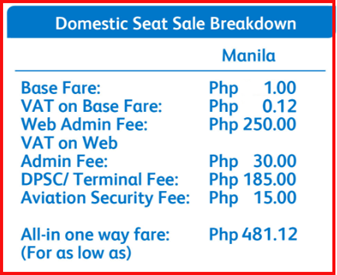 Purchase the low fares at Cebu Pacific ticketing offices, travel agents and booking offices in Manila, Luzon, Visayas, Mindanao. Call the Cebu Pacific hotline at telephone numbers: (02) 702 0888 (Manila) or (032) 230 8888 (Cebu). Piso fare promo tickets can be paid via Credit/ Debit Card, BancNet, PayPal and Alipay. Will you be bringing several bags or heavy luggage during your travel? It is best to get a Prepaid Checked Baggage Allowance to save on checked baggage fees. Prepaid Baggage Allowance can be availed during booking or up to 4 hours before your scheduled flight. Other Add-ons like reserving your favorite seat and getting travel insurance can be pre-booked up to 4 hours while pre-booking of meal can be done up to 24 hours prior to flight departure. Need more airline seat sale and promos? LIKE and FOLLOW our Facebook: PISO FARE Ticket for more Cebu Pacific piso fare promo 2019, Philippine Airlines seat sale 2019, Air Asia red hot sale and travel updates!! !